Regional Medical Research Centre, Dibrugarh. 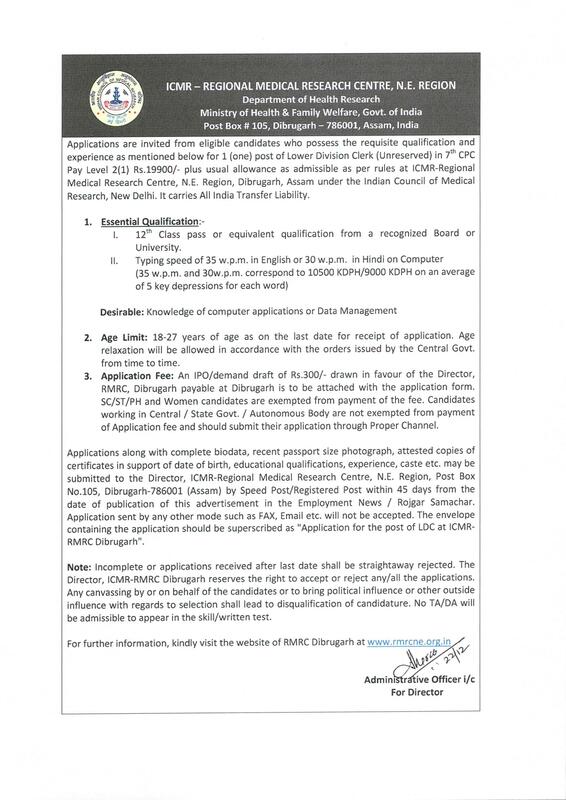 Applications are invited from eligible candidates who possess the requisite qualification and experience as mentioned below for 1 (one) post of Lower Division Clerk (Unreserved) at ICMR-Regional Medical Research Centre, N.E. Region, Dibrugarh, Assam under the Indian Council of Medical Research, New Delhi. I. 12th Class pass or equivalent qualification from a recognized Board or University. Age : 18-27 years of age as on the last date for receipt of application. Age relaxation will be allowed in accordance with the orders issued by the Central Govt. from time to time. Application Fee: An IPO/demand draft of Rs.300/- drawn in favour of the Director, RMRC, Dibrugarh payable at Dibrugarh is to be attached with the application form. SC/ST/PH and Women candidates are exempted from payment of the fee. Candidates working in Central / State Govt. / Autonomous Body are not exempted from payment of Application fee and should submit their application through Proper Channel. How to apply: Applications along with complete biodata, recent passport size photograph, attested copies of certificates in support of date of birth, educational qualifications, experience, caste etc. may be submitted to the Director, ICMR-Regional Medical Research Centre, N.E. Region, Post Box No.105, Dibrugarh-786001 (Assam) by Speed Post/Registered Post within 45 days from the date of publication of this advertisement in the Employment News / Rojgar Samachar. Application sent by any other mode such as FAX, Email etc. will not be accepted. The envelope containing the application should be superscribed as "Application for the post of LDC at ICMR-RMRC Dibrugarh".